One more recipe that might come in handy this holiday weekend if you want to stick with your raw food or vegan diet, ranch dressing. Ranch is America’s favorite dressing and a picnic classic! 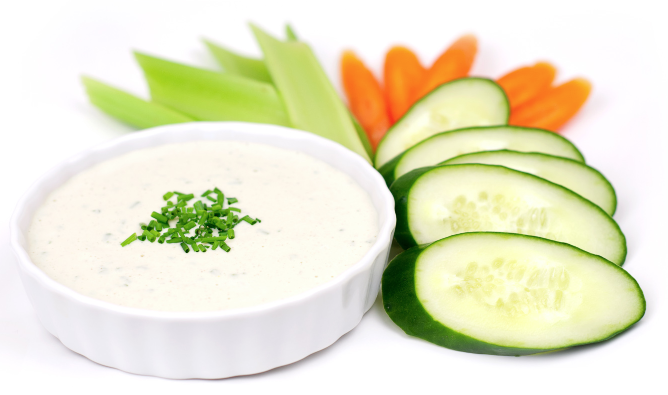 This raw food recipe for ranch has fooled even the biggest Hidden Valley Ranch fans. Serve this without mentioning that it is a dairy-free dressing and see if anyone notices! Enjoy. Start by adding the cashews, lemon, and almond milk, salt, and 1/4 teaspoon of both the onion and garlic powder to the Vita-Mix. Blend until creamy. Taste and adjust seasonings keeping in mind that you will add the dried parsley and chives by hand once the dressing is out of the blender. Once you have it seasoned to your liking, pour the mixture into a mixing bowl then add the chives and parsley. To save time, you can omit the cashews, lemon juice, salt and garlic and use 3 to 5 tablespoons of nut cheese. The Garlic Cheese and Pine Nut Ricotta both work well for this cheater version of the Ranch Dressing. You are welcome. Get creative with the spices. I like a spicy ranch for dipping sweet peppers and I add organic mustard and use it as the sauce for my mock-potato salad. Somer, I hear you sista! If you want a fun salad option without leafy greens try a chopped salad of zucchini, red pepper, an little jicama, then add some sprouted rice or sea grass seeds, fresh cilantro leaves and corn cut from the cobb. YUM! If you can get all the way through to enjoying this dressing as the sauce for the kale chips, you will love it! Collen, you are right! The flavor is mild before dehydration because the removal of moisture from the finished product concentrates the flavor. What tastes mild going in the dehydrator is intensified by completion. Keep that in mind when you play around with recipes to save yourself from over-flavoring (often times people add WAY too much salt) your dehydrated snacks & treats. Oh my gosh, thank you for this! I’m starting on Raw Food tomorrow and was really nervous that I wouldn’t like my salads as I’m trying to avoid too many oils and vinegars. This is AMAZING! Is it mandatory to soak the cashews?